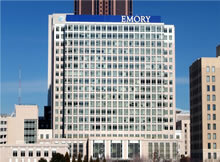 The new Emory Wound and Hyperbaric Center has opened at Emory University Hospital Midtown. The center provides comprehensive wound management using the latest evidence-based techniques, which include specialized wound care, bioengineered skin grafts and hyperbaric oxygen therapy. The new center is a consolidation of the Wesley Woods Wound Clinic and Midtown’s Hyperbaric Unit. The facility has been completely renovated and an open house will be held on Thursday, March 13 from 4 p.m. to 7 p.m. Patients of the center will receive coordinated care by a team of specialists consisting of nurses certified in wound and ostomy care and board certified physicians, including a podiatrist with special expertise in wound care. "Individuals with chronic wounds often require a variety of services and the expertise of different specialists," says Doris Armour, MD, medical director of the center. "We now provide all of that care in one location." The treatment team will work collaboratively with other providers involved in the care of the patient, such as primary care providers and home health nurses, to ensure the patient’s wound care needs are being addressed. "We also have access to specialists including plastic surgeons, vascular surgeons, and infectious disease doctors, whose assessment is often needed in the treatment of chronic wounds," says Armour. In addition to wound care, the center also offers hyperbaric oxygen therapy that is used to treat a wide range of conditions including carbon monoxide and cyanide poisoning, decompression illness, radiation injury and burns. Hyperbaric oxygen therapy helps improve healing by providing increased oxygen levels and improved blood flow to damaged, oxygen-poor tissues. Increased concentrations of oxygen are delivered within a pressurized chamber. For more information or to schedule an appointment, call 404-686-2800.